Great Blue Video Slot Guide & Review - Casino Answers! Great Blue is a 5-reel, 25-line video slot developed by Playtech, featuring stacked wild substitute symbols, scatter wins, multipliers, a gamble feature, a free spins feature and a bonus game. You can play the Great Blue video slot game at Casino Tropez and Omni Casino. 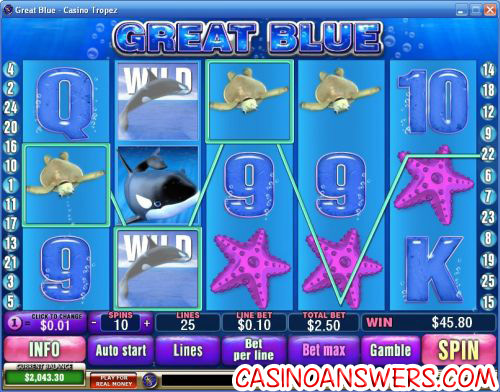 Great Blue is an ocean-themed video slot, with symbols of many of the different creatures that live underwater. Symbols on the Great Blue video slot include the Whale, Shark, Turtle, Seahorse, Starfish, Fish as well as the Pearl scatter symbol and Ace, King, Queen, Jack, Ten and Nine symbols. Great Blue has lots of tropical music that plays when the reels are spinning, while you are viewing the paytable or on winning combinations. There are also lots of animations, including symbols and some bubbles near the logo. Coin values on the Great Blue slot machine are $0.01, $0.05, $0.10, $0.25, $0.50, $1, $2 and $5. Depending on the casino you play at, the higher coin values may or may not be available. You can play up to 25 lines and set your line bet from 1-10 coins by clicking on the “Bet Per Line” button. To play all 10 coins with all 25 paylines, hit the “Bet Max” button. Great Blue has a great betting range, from a penny per spin all the way up to $1250 per spin. No matter if you are a high roller or a casual player, you will be able to play Great Blue with your desired wager. To play Great Blue, hit the “Spin” button. The highest paying symbol on the Great Blue slot game is the Orca Whale symbol. If 5 of these symbols land on a selected payline, you will win the 10,000 coin top jackpot. The Orca Whale symbol is wild and will substitute for all symbols except for the scatter symbol. Whenever it completes a winning combination, it will act as a 2X multiplier and double your winnings. The Killer Whale symbol is stacked, thus it is likely the Whale symbol will appear in all three positions on a reel. The Pearl symbol is Great Blue’s scatter symbol. 2, 3, 4 or 5 Pearl symbols anywhere on the reels will pay out 2X, 5X, 20X or 500X your total bet. Also, three of them will trigger the Great Blue bonus game. You will start out with 8 free spins and a 2X multiplier. 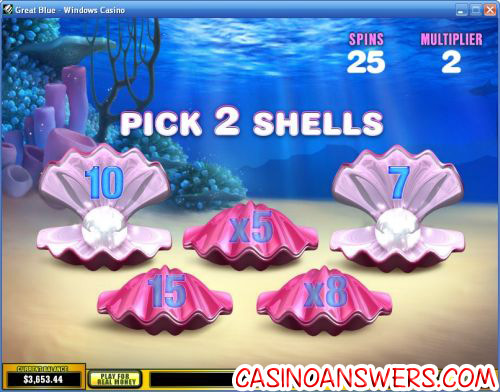 You must pick two of the five shells to win additional free spins and multipliers. You can win as much as 33 free spins or a 15X multiplier in the bonus game. If you re-trigger the bonus game, you will win 15 more free spins with the same multiplier. You can win additional free spins to infinity. With the bonus game and subsequent free spins feature, you can catch some great wins on the Great Blue online slot game at Casino Tropez! Any time you win on the Great Blue video slot, you can use the gamble feature to double your winnings! Launch the gamble feature by hitting the “gamble” button following any win on Great Blue. All you have to do is choose whether the next card will be red or black. To exit the gamble feature and save your winnings, hit the “Collect” button. You can double your winnings until you reach the gamble limit, which varies depending on the casino you play at. It should be $1000 or $2000 at most online casinos. Great Blue has an autoplay mode, although it doesn’t offer much in the way of settings. Simply type in the number of spins you wish to play and hit the “Auto Start” button. To stop autoplay, all you have to do is hit the “Stop” button. The Great Blue video slot offers excellent graphics, music and sound effects, as we have come to expect from Playtech. The slot game also gives you the chance to win big with its high top payout, stacked wilds and free spins feature. To play Great Blue, sign up and deposit today at Casino Tropez! Are players from the United States able to play Great Blue for real money? No, American players cannot play the Great Blue video slot for real money at this time. For an alternative, you can read our Ocean Dreams Video Slot Review or play the casino game at Slots Oasis Casino. For more on Slots Oasis, please read our Slots Oasis Casino Review. Is there a Great Blue Flash game I can play for free? While Playtech does offer many different slots and other casino games in their Instant Play Flash casinos, Great Blue is not among the games currently offered at Casino Tropez‘s Instant Play casino or Omni Flash Casino.